Terhas Clarke and Alejandra Carvajal introduce us to the work of President Lenin Moreno of Ecuador, the first person in a wheelchair to be elected as a head of state in Latin America, and an influential figure that has improved rights for people with disabilities on an international and national level. They invite readers to join the discussion on inclusive development: what inclusive development should look like and how the discussion can remain inclusive going forward. According to the World Bank’s 2011 Disability Report, one in six people worldwide live with some form of disability, making people with disabilities the world’s largest minority group. More than 80% of the world’s disabled people live in developing countries, where they face not only extreme physical barriers but also a severe lack of legal and social protections. In Latin America and the Caribbean, the situation is particularly dire. Roughly 82% of the disabled population live in poverty, with 90% unemployed and a large majority excluded from government social-welfare and employment programmes. Worldwide, 20% of those living on less than $1.25 per day also have some form of disability, often being forced to resort to begging as a primary means of survival. Among policy makers, development practioners and, as the LSE has also admitted, academia, the link between disability and development has often been ignored. 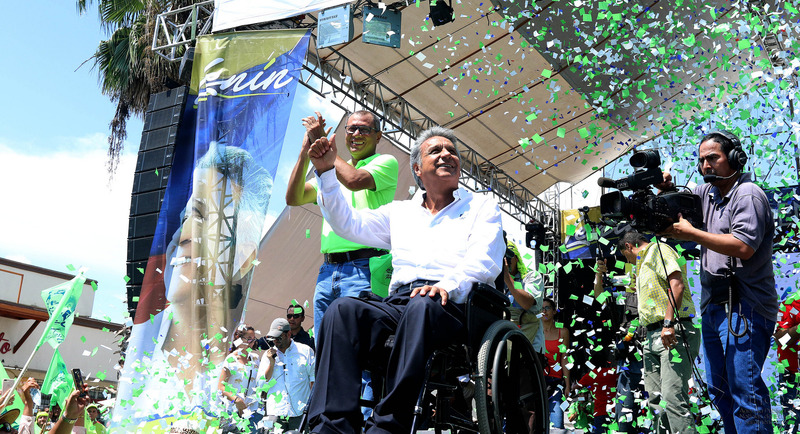 However, the recent election of Lenin Moreno- a wheelchair user- as president of Ecuador could provide the spark for a broader debate on this vital issue. Moreno, who previously served as vice president, was shot during an attempted robbery in 1998 and lost mobility of his legs. Now, the first wheelchair user to become head of a Global-South state, Morena has become a symbol and a champion of the tireless battle against the discrimination of those who live with disabilities. From the very beginning of Moreno’s vice-presidency, disability rights were placed centre-stage on Ecuador’s national agenda.Moreno pushed for the country’s first ever disability census, helping to obtain data on the number of citizens living with a disability and identifying this population’s individual needs. This data fed into the creation of special laws, programmes, and institutions, not least the National Council for the Equality of Disabilities in Ecuador, charged with implementing a comprehensive national strategy to make every sector of Ecuadorian society disability-inclusive. Reformed labour laws aimed to ensure decent work through the implementation of a quota system that would encourage firms to hire employees with disabilities. The national government also started to craft new accessibility regulations, leading to the renovation of homes and public buildings to allow better access for people with disabilities. At the same time, disability-discrimination training was rolled out and new requirements on availability of sign-language interpreters for the deaf and hard of hearing were put in place. Access to democracy was also bolstered by enforcement of regulations requiring polling station officials to provide ballots to those unable to leave their homes. Ecuador also established a major social protection programme providing monthly cash-transfer benefits for people with disabilities who are unable to work. While there is still a lot of work to do to make Ecuador a truly inclusive country, the adoption of these national regulations serves to demonstrate that it is possible to address the challenges facing those with disabilities in developing countries as long as there is institutional willingness to do so. At the international level, meanwhile, Moreno, as the UN’s Special Envoy on Disability and Accessibility. energetically promoted the adoption of the 2007 UN Convention on the Rights of Persons with Disabilities (CPRD), the first ever global convention to recognise disability rights as human rights. The CPRD details how states can guarantee that people with disabilities enjoy equal human rights in legal frameworks, policy, and budgeting. It has also helped to make the UN’s 2030 Sustainable Development Goals disability-inclusive, with goals on education and health for children with disabilities boosting the prospect of positive change at the global level. Moreover, whereas the world’s first head of state to use a wheelchair – US president Franklin D. Roosevelt, in office 1933-45 – made every effort to hide his disability, Moreno made his wheelchair a central part of his presidential race in 2017. This not only reflects a shift in how disability is viewed, it also provides hope that Moreno’s approach can serve as a catalyst for further change given the greater exposure provided by presidential office. Moreno’s background as a national and international promoter of disability rights has now combined with his new position as a world leader to open up debate on how the field of development can better foster inclusion. There is a sense that the time has come to evaluate how programmes and mechanisms promoted by international development organisations are including the world’s “largest minority group” and beginning to reverse its longstanding exclusion. For the international disability community, Moreno’s presidency has the potential to transform the future of what disability and development means, not only in Ecuador, but also in other developing countries around the world. Now it falls to academia, students, leaders, policy-makers, entrepreneurs and development practitioners to continue researching and implementing solutions for inclusive development. Specifically, we need to identify ways to foster an open dialogue on what the future of development that includes people with disabilities will look like and what strategies are needed to make it a reality. We would like to create space for this dialogue on inclusive development, and we invite you all to join in the discussion via the comments section (below). Terhas Clark is a student on the MSc Development Management programme and has had previous experience with working on disability inclusive livelihoods projects with USAID and United States African Development Foundation. Alejandra Carvajal is a student on the MSc Development Management and has experience with working on development projects with indigenous communities and victims of conflict with the Government of Colombia and the International Organization for Migration. This article was written in partnership with the Latin American and Caribbean Centre at the LSE.